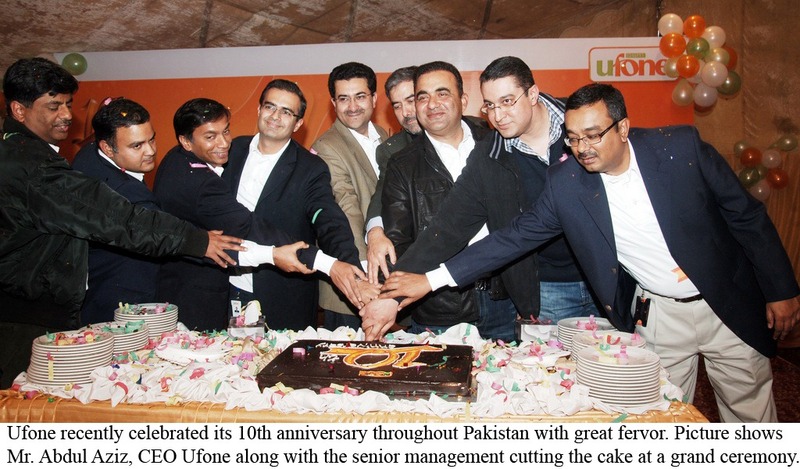 Ufone turns 10 as the company celebrated its 10th anniversary on 29th January. Ufone started out as a service for the masses and it pushed to remove the perception and reality that cellular services were only for the elite in the country. Today cellular services are enjoyed by people from every walk of life which has been made a reality thanks to the promise that Ufone once made to the people of Pakistan and has fulfilled that promise through this journey of 10 years. Ufone has shown vast growth and endurance throughout the decade, even though with the intense competition; the organization has shown great reverence with its increase in revenue and has always remained profitable. Over the last few years the world has witnessed one of the worst global recessions during which downsizing was one of the major cost cutting techniques used by organizations, On the other hand Ufone stood out by not following the trend and instead motivated and acknowledged its employees by giving more financial benefits and focused on growth in all business areas with a major focus on corporate social responsibility and has always come out to help the people of Pakistan through testing times. This is indeed an emotional moment for me as 10 years ago I was part of a very small but highly committed and focused group of individuals who helped start Ufone. We stand tall today in the market because of our incredible service orientation, and a great team spirit that did not fade out due to time; it only grew stronger. From the day that we launched till now, we as an organization value the essence of our corporate mission and vision of Becoming the Best Cellular Option Available for U!.